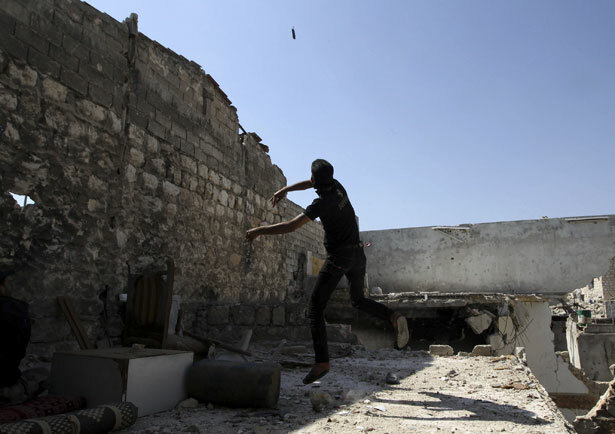 Aiding Syria’s ragtag rebels means, well, backing Al Qaeda. Here’s the thing about a slippery slope: sometimes you maintain your footing and don’t go tumbling down, and sometimes you slip and slide right into disaster. With the apparent decision to arm the Syrian rebels, President Obama looks like he’s going to go kersplat! onto his face and land smack dab in the Syrian quagmire. It is, of course, a quagmire partly of his own making. Though he’s instinctively resisted getting directly involved in Syria, Obama’s first mistake was made in 2011, when he demanded that President Bashar al-Assad step down. Not only did Obama have no power to make that happen, but by demanding it he turned a relatively small-scale rebellion into a raging civil war pitting an amalgam of rebels, including large numbers of Sunni extremists and Al Qaeda types, against a fully armed modern state army. Second, Obama compounded his mistake by helping Saudi Arabia and Qatar arm the rebels, despite the fact that much of that aid went to the extremists. And then he ordered the CIA to get involved in training the rebels, secretly, in Jordan. Finally, his comments about a “red line” if and when Syria used chemical weapons gave ammunition to hawks, neoconservatives and the far right to demand that Obama go to war in Syria once evidence of a very limited, marginal use of some gases became apparent. That’s the slippery slope that Obama created, and now he tumbling in. So yesterday the White House decided to send weapons to the rebels. Reading the White House’s statement on the matter, it’s clear that they’re not quite ready to go all in, but that’s the problem with a slippery slope: once you send in small arms and ammunition, next comes anti-tank weapons, shoulder-fired anti-aircraft missiles and—oops!—before you know it, you’re bombing Syrian airports and imposing a no-fly zone. The President has augmented the provision of non-lethal assistance to the civilian opposition, and also authorized the expansion of our assistance to the Supreme Military Council (SMC), and we will be consulting with Congress on these matters in the coming weeks. In fact, it may be too late for the United States to alter the course of the war. The commander of the Syrian Military Council himself has flatly turned down Secretary of State John Kerry’s invitation to attend a peace conference, insisting instead that the rebels get advanced, high-tech weapons. In recent weeks the Syrian government has made important battlefield advances, and by all accounts the tide of war has turned sharply against the Saudi Arabia– and Qatar-backed fighters, the Al Qaeda forces and others. As in Vietnam, when the United States persisted in that hopeless war in part because it felt like to withdraw would damage American credibility, in Syria there is a real chance the President Obama will slide all the way down the slope to full-scale war simply because he won’t want to tolerate an Assad victory. Such a victory would be a big win for Assad, for Iran, for Hezbollah—and for Russia, too, which has bet on Assad’s ability to hang on. If that happens, it’s only because Obama naïvely bet that the Arab Spring movement that toppled leaders in Egypt and Tunisia—and in Libya, with an American military push—would easily knock off Assad.